Gardening in small spaces just got a whole lot easier with the Mark’s Choice potato planter. 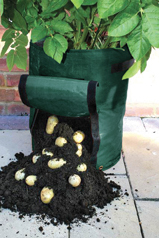 Plant potatoes in layers from the bottom to the top, and harvest from the trap door at the bottom of the reusable bag. You’ll enjoy potatoes from mid-summer onwards. Mark Cullen is an expert gardener, author & broadcaster and holds the Order of Canada. His son Ben is a fourth-generation urban gardener and graduate of Guelph and Dalhousie University.